I don’t know what the last few days have held for you. Perhaps it’s been a relatively easy week. Maybe a hard one. Or you might have had a bit of both mixed together. And if you’re like me, you’re looking back over all of it and wondering if you could have done more, tried harder, been a little bit better. So let’s pause for a moment and take a deep breath together. It’s time to remind ourselves that life is not about doing. Life is about loving. That means if you reached out in kindness to someone this week–offered a smile, gave a hug, listened, helped, comforted, supported, encouraged–then you did well. And it is enough. We may understand that we’re free from Old Testament laws and are now under grace. But we can still make up new laws for our lives. They take the form of to-do lists. They show up as unrealistic expectations. They form themselves into accusations that taunt us as we drift off to sleep. Friend, don’t hold up your week and decide how you did based on law. See instead through the eyes of grace and look for love. That is what matters most. Not the clean kitchen. Not the completed project. Not the list of goals neatly checked off. Thank you for this post. Your message is so recognizable. I also make to-do-lists all the time and let my selfconfidence be based on how well I’ve done… Your post helps me see it in another way. I’m gonna print it and hang it in the bathroom! Thank you so much for your words of encouragement. You have no idea how much I needed to hear this today. I battle an illness that often leaves me unable to do anything “productive”. Sometimes it’s hard to keep God’s prospective on my life. Today was one of those times. Thanks for reminding me again! I love you, my friend! Thank you for the reminder, Holley. After all, it really doesn’t mean anything if the root of our actions or words don’t come from love. And I have learned that I don’t have to know someone for years and years to love them because it is not a feeling I develop, but the choice to love people because we are capable of loving in abundance through Jesus. Beautiful reminder, thank you. Thank you Holly for this perspective!!! Always a challenge for me to focus on Being and not Doing but seeing that if lives are touched and loved on the journey of doing I have done something that matters sure helps me!! Thank you!! Blessings to you fir a great weekend!! Holley, I woke up this morning mad at myself for having not accomplished more on my goal for the month of January. And I have wasted time – can’t deny it. But I have also loved well and followed the Lord in other ways that are valuable. Something inside me relaxed and smiled when I read your words this morning. Blessings on you today. We spent the beginning of the week in the hospital with my 11 year old son who was diagnosed with seizure disorder and now has to take seizure medicine. We are still waiting on other tests that could have a big impact on his life. The end of the week was spent battling the southern snow. It has been very challenging this week, but much love has been shared. Please pray for my son and our family as we adjust to this new wrinkle in life. “Friend, don’t hold up your week and decide how you did based on law. See instead through the eyes of grace and look for love.” Wow! Such an appropriate and amazing reminder for me. I grew up in a legalistic church and it’s hard to root out that “law” stuff. I put so many unrealistic expectations on myself and then beat myself up if I don’t fill them. Thanks so much for your perspective, Holley, and for your encouragement. LOVE this! Beautiful thoughts, Holley. Thank you so much. 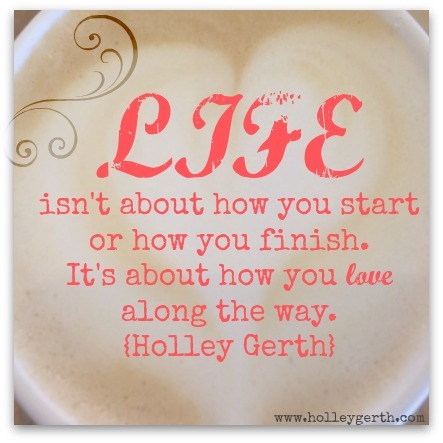 POWERFUL post today, Holley! Thank you for your wisdom: “Life is not about doing; life is about loving.” And thank you for the reassurance that there are more important things in life than the to-list, that our self-worth should not be wrapped up in the number of check marks on that list at the end of the week. LOVE is enough. Even your list of possible expressions is helpful, showing us that love includes some very simple actions–things we all do without even realizing we’re demonstrating the love of God. Too often, at the end of the day, I feel as if I haven’t accomplished what I started out to do in the morning. What has come between my mental to do list and the done list? People. People I love. Tomorrow will have it’s own to do list, but I can’t worry about what wasn’t done today. Today was spent doing what my Lord presented to me and it doesn’t get any better than that! (eg. dishes…play with grandchildren…dishes…play with grandchildren…grandchildren, you win!!! The dishes will get done eventually after the grandchildren are gone home.) Thanks Holley for putting all this into your own words of encouragement for all of us! This message is so needed. I can feel like such a failure by week’s end. Until recently I so looked forward to the grace of weekends, but now, not so much. An unanticipated dissolution is staring me in the face after 24 years. I am lost and lonely but am convinced that God still has a plan for me. I just need to find it. Have a blessed weekend girlfriend. Thanks Holley for always keeping it so simple and so positive! God bless you. lovely end of week encouragement. Thank you Holley. Thank you for this encouragement today, Holley. Hope you enjoy a wonderful weekend! Holley, just before I sat down to check my emails that is exactly whatiI was doing…thinking about the week’s woes and all the weariness I am feeling tonight and all the things I said or did that could have been do e better or differently. And while I still feel some reflection is necessary to make positive changes in our words, behaviors, and lives, I also truly appreciate this post as a reminder to me that there were more great moments and that God’s gifts and blessings, strength and Spirit to carry out His plan for me according to His will and divine purpose, far outweigh the few moments that linger on in my head. So I will fill my heart by resting in Jesus knowing that His compassions and mercies are new everyday and His grace is all encompassing in every moment in my life! God bless! Thank you Holley. This week at work was rough. But I continue to have and show love to those that are heartless. I look forward to your encouragement everyday. May GOD continue to bless you and have a GREAT weekend. Yes my dear sister, it is only about ” Loving and being loved”. I should keep it always in my mind, especially in hard times. Thank you for your beautiful words of wisdom. This was helpful, puts your focus on what matters. I had a very busy week, yesterday was nice because it was very busy, but I felt loved and loved several times through out the day, today was not so kind, it was almost too busy to love and at the end of the day I didn’t feel the love when I came home and that was hard. I felt many emotions because of it, but when it comes down to the real problem it is because many of us are hurting or unsure, maybe even fearful of what lies ahead and what we really need to do is take your advice Holly and love and be loved no matter what may come or go…that is what makes it all better. God is love and if we can just give and receive love, I know no matter what…everything will be ok. I love reading your writings! Thank You! You have such a way of giving life a certain clarity with your words, which helps us not to be burdened with things we were never asked to carry. I have been struggling SO much this week with balance and feeling every night like I have failed AGAIN to do the right thing. I am a missionary to a remote village in the Philippines and there are so many needs all around. Everyone needs help of some sort, spiritual help, physical help, emotional help. I also have a husband and two little kids to love, feed , teach and care for all in the midst of this wonder of life. My list of tasks which I think are so important….never gets completed. “Loving and being loved.” So freeing. Grace and Truth. Thank you for helping me today to not look at my day as a “right-off” but to instead base my thoughts and feelings on His Word. Your post today remind me of 1Corinthiams 13:1 …and I don’t want to be a noisy gong or clanging symbol! Thank you. What a reminder that productivity is measured in how we meet the needs of others, not how many things we can cross off a to-do list! Thank you for the encouragement Holley. I hope you weekend is restful ! It’s so easy to get caught up in our to-do lists and lose sight of what really matters, and that is loving by doing for others. Brilliant post :). I have totally been guilty of living under “the law” of my tasks at least a couple times this week. Wooo, but what a necessary reminder for us. Chores barely happen for me when I have a 3 month old and an almost 2 year old. But as a dear friend reminded me this week: all that really matters is that Asher receives unconditional love. But sometimes when I can’t even get the neccessary tasks like laundry and groceries done its really because I’m loosing sight and not being flexible. It’s totally my inflexibility that makes me want to punch a hole in the wall when tasks don’t get done. Is that kind of anger loving? Newp. Law brings sin, love fulfills the law. Thank you for sharing this. I love your posts :). I just found your blog recently and I love it! Thank you, Holley. Oh how I want to remember this! I had such a hard, busy week last week, but this thought encouraged me to know end. This is what I want to take with me to start a new week tomorrow! I really needed this Holley. Thank you. This is lovely. I could not be more encouraged today. Your words wrap a person like a blanket. Thank you for being faithful to share the words God has placed on your heart, Holley! I look forward to meeting you soon! It is a true gift to read what you have said today! Only the lover of our souls could have walked me courageously and victoriously through the ground shaking week that it was. I reflect on His Grace to stop and pray so very many times. On my feet because I work at 6 rural Maine schools. Aslan the Lion who soon wss to be slayed as Jesus, spoke loudly me through this classic literature. I received an email fromy landlord in Florida regarding her husband. After a successful knee surgery, my landlord died of a stroke one week after – on Monday. I felt so much pain for his wife’s loss. In Tuesday, the caretaker of the property I live on, John, has so wonderfully plowed, sanded and shoveled during my recovery from a recent car accident that caused a fractured right foot and hand. His beautiful 17 year old daughter was hit in a head on car collision that left her in a comma in the hospital. As the week went on there serious snowstorms causing delays at school. Valentine Day, our 100th day of school came and went, school was called off. Then the next email came from a friend for prayer for a 2 year old little girl Alexis whose Daddy accidently ran over her. I began my school vacation with the flu. The coughing kept me awake into late hours last night. While awake I prayed for my daughter’s safe journey home from Smith College during a snowstorm that left nearly 1 foot of snow. Prayers are precious to our Creator. The coughing kept me awake to pray for my daughter’s safe journey home. It took her 6 hours to do the 3 hour trip. What an amazing prayerful week to be a part of. He is my strength, my joy and my sustainer as I lay down and pray. and other data, is there anyy other web page which presents such information in quality?